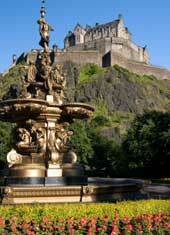 Edinburgh, the inspiring capital of Scotland, is a historic, cosmopolitan and cultured city. The setting is wonderfully striking; the city is perched on a series of extinct volcanoes and rocky crags which rise from the generally flat landscape of the Lothians, with the sheltered shoreline of the Firth of Forth to the north. Edinburgh Castle is worth a day out by itself and contains a wealth of history. The castle houses the Honours (Crown Jewels) of Scotland, the Stone of Destiny, the famous 15th century gun Mons Meg, the One O' Clock Gun and the National War Museum of Scotland. The castle is at the top end of the Royal Mile which is full of interesting architecture and places to visit, such as St. Giles Cathedral, John Knox's House and Mary King's Close. Whilst staying at the victoria park house hotel, why not experience the wonders of the plant kingdom in Scotland’s Premier Garden. The Royal Botanic Garden Edinburgh offers visitors peace and tranquillity amongst 72 acres of stunning scenery. Founded in 1670, the Garden is acknowledged to be one of the finest in the world where unusual and beautiful plants can be found. The garden is alive with opportunities for discovery, from an eco-tour of the world in the magnificent Glasshouses, featuring Britain 's tallest Palm House, to the award-winning art gallery at Inverleith House. Enjoy the serenity of Chinese Hillside, explore the world-famous Rock Garden or stroll amongst the magnificent giant Redwood trees in the Woodland Garden . Open all year, the garden hosts a popular programme of events, exhibitions and guided tours. Admission to the garden is FREE. The Palace of Holyroodhouse is most strongly associated with the tragic yet romantic story of Mary, Queen of Scots. It was here that a pregnant Mary witnessed the murder of her Italian secretary, David Rizzio. A tour also allows you a rare behind-the-scenes glimpse of royal life today as the palace is The Queen's official residence in Scotland. 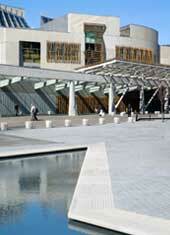 And afterwards you can always pop across the road to check out the new Scottish Parliament. 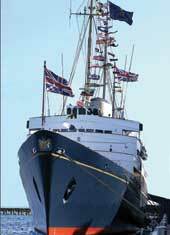 After touring the world and welcoming the titled and privileged aboard, the Royal Yacht Britannia has now settled into its permanent home in the port of Leith. From the State Dining Room and private royal bedchambers to the interpretation centre in Ocean Terminal, this truly is a five-star attraction. The collections tell the story of Scotland : its land, people and culture. What influence has the world had on Scotland, and Scotland on the world? Scotland is the home of golf and Edinburgh has over 20 golf courses within a few miles of the city. There are some excellent courses throughout the Lothian region, including Dunbar, North Berwick, Musselburgh, Gullane and The Open Championship course at Muirfield. Edinburgh's Hogmanay is a fantastic four-day festival of events, music, street theatre, outdoor activities and of course, the best New Year party in the world. The highlight of the rugby union calendar - the leading countries in Europe prepare to battle it out in the RBS Six Nations Championship. Murrayfield - the home of Scottish Rugby since 1922 and one of the oldest stadiums in the six nations championships, it also had a facelift in 1994 and today has a capacity of 67,000. Book online now for Six Nations weekends! The Edinburgh International Festival, International Film Festival, The Edinburgh Fringe, Book Festival and the Jazz Festival are hosted in Edinburgh around August. Many visitors come from all around the world to take part in the Edinburgh Festivals or to watch the famous Edinburgh Military Tattoo. The Tattoo is, a spectacle really worth seeing, and seems to get better each year. On the final night (around the 4/5th of September) there is an unforgettable fireworks display. Book online now for August festivals!